A creature of the other world, an unnatural entity bent on chaos and carnage, has come to stalk the nighttime streets of the Galicien city of Davillon. There’s never a good time for murder and panic, but for a community already in the midst of its own inner turmoil, this couldn’t possibly have come at a worse one. Not for Davillon, and not for a young thief who calls herself Widdershins. It’s been over half a year since the brutal murder of Archbishop Wil­liam de Laurent during his pilgrimage to Davillon. And in all that time, Widdershins has truly tried her best. She has tried to take care of Genevieve’s tavern and tried to make a semihonest living in a city slowly stagnating under the weight of an angry and disapproving Church. She has tried to keep out of trouble, away from the attentions of the Davillon Guard and above the secrets and schemes of the city’s new bishop. But she’s in way over her head, with no idea which way to turn. The Guard doesn’t trust her. The Church doesn’t trust her. Her own Thieves’ Guild doesn’t trust her. Too bad for everyone, then, that she and her personal god, Olgun, may be their only real weapon against a new evil like nothing the city has ever seen. After reading Thief's Covenant, the first book in this series (my review), and absolutely loving it, I had very high hopes for False Covenant. 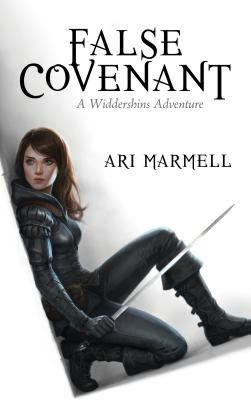 I was already a loyal fan to the series, even having only read one book, but False Covenant changed my status from "loyal fan" to "die-hard, I need every book Ari Marmell has ever written, obsessed-fan-girl." It's a major page turner! Literally, my eyes were glued to the pages, and there wasn't a single thing that could tear me away. I even sat at my kitchen table eating dinner while reading. I got some weird looks from my family, but it was totally worth it! And there's a new, and much creepier antagonist in this book! Just reading about him gave me goosebumps. It amazed me how Ari Marmell managed to give even the bad guy a really interesting and dynamic personality, instead of just making him "the evil dude." I actually really enjoyed reading the scenes with him. Overall, I give False Covenant a solid 5 out of 5 stars. This is a series not to be overlooked. It has everything a fan of fantasy could possibly want, and even those afraid to venture into high fantasy will love it. Anyone looking for a great story, check out the Widdershins Adventures novels.